Guess which retail chain operates the country's largest multi-product, multi-brand service centre? If you thought it's one of the marquee national names, think again. 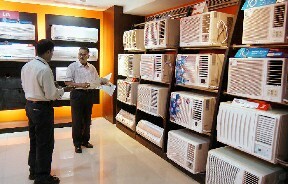 It is Chennai-based electronics and consumer durables chain Viveks. B A Kodandaraman, the 72-year-old chairman & managing director, knows it is after-sales service that will separate the men from the boys in the highly competitive retail sector, especially when big corporate houses are muscling their way into the segment. Authorised by 34 brands, Viveks has 160 skilled technicians, who provide after-sales, collection and delivery services to customers in Chennai. The chain, run by three brothers Kodandaraman, Chandrashekar and Srinivasa, expects a turnover of Rs 400 crore this financial year, nearly 15 per cent more than last year. While it opened just three stores in the first 30 years of existence, Viveks - named after Swami Vivekananda - added 47 stores between 1995 and 2010. The company plans to open 50 more in the southern region, but hasn't specified a time-frame. A host of family-owned, regional retailers are reinventing themselves as they gear up for a larger retail footprint in the country. Take D-Mart, a chain promoted by stock broker R K Damani. "We want to be the lowest-priced retailer in the areas we operate in," reads the company's mission statement in its corporate office in Powai, a Mumbai suburb. The chain demonstrated this recently when competitors began advertising a 'minimum 6 per cent discount' offer on its products. D-Mart increased its discount to 7 per cent. The 10-year-old, 33-store chain is now gearing up for national expansion. Recently, it ventured out of its stronghold of western India by opening two stores in Hyderabad. Next in line: Bangalore. Last financial year, D-Mart racked up business of Rs 1,100 crore (Rs 11 billion) and is looking at a 30 per cent increase in the current year. All its stores have broken even and have low to medium double-digit growth in same-store sales, depending on the age of the store. In comparison, Kishore Biyani's Pantaloon posted 12.5 per cent growth in same-store sales in the September quarter of the fiscal. Larger, national competitors are impressed. "In the last 10 years, D-Mart has come a long way. It offers a good range and availability," says Thomas Varghese, chief executive of Aditya Birla Retail, which runs stores under the More brand and competes with D-Mart in Mumbai, Thane and Pune. But, how do these chains take on the onslaught of large retail chains and cater to customers spoilt for choice? "Most of them are led by entrepreneurs, who have seen it and done it for a long time. Since they are regionally concentrated, they understand customers well," says Anand Raghuraman, partner & managing director, Boston Consulting Group. Apart from understanding customers, they also know a great deal about low-cost sourcing. For Hyderabad-based Heritage Foods, promoted by former Andhra Pradesh chief minister N Chandrababu Naidu, retail is about strong back-end support. Heritage Fresh, the 74-store retail chain of the group, sources most of its food requirements from its own units. Dairy products, which constitute 6-7 per cent of its sales, come from the group's diary business, which has a strong presence in south India. Similarly bakery items, which constitute 4 per cent of sales, come from its in-house bakery. "Heritage has a 50-member team that sources 55 per cent of its fresh produce locally in the areas where it operates. It has state-of-the-art packaging houses with cold chains and warehouses," explains M Sambasiva Rao, president, Heritage foods. The company expects a Rs 200-crore turnover this fiscal. Most regional retailers say they also ensure adequate attention is paid to consumer experience. Nilesh Gupta, managing partner of Vijay Sales, a Mumbai-based durables and electronics chain, says: "Consumer experience is what matters, and we score there." For example, when plasma televisions were introduced some years ago, most retailers used to display only a couple of them, But Vijay Sales set aside an entire wall for such televisions. The 43-year-old Vijay Sales runs 37 stores in Mumbai, Pune, Gujarat and Delhi. The chain plans to set up 100 stores in the country in the next five years. The company is expecting business of Rs 1,200 crore this financial year, nearly 30 per cent higher than last year. "These regional retailers have built relationship with families for a long time. We should think about how modern trade can learn from them by using the enterprise resource planning solutions we have," says Ajit Joshi, chief executive of Croma, the durable and electronics chain of the Tatas. But the regional chains have a number of hurdles to cross as they chalk out plans to grow big, say consultants. "When you expand into new places and set up stores, you have to compete with established players. Managing 100-200 stores is far harder than running 30-40 stores," says Raghuraman. Regional retailers know this all too well and offer thanks to national chains for shaking them up. Gupta of Vijay Sales concedes that the chain has become more agile after the entry of large chains. "If they had not been there, we would have been 23-24 stores instead of 37," says Gupta.